When using eWAY’s Responsive Shared Page, you will probably want to show different confirmation messages for successful payment and failed / cancelled payment. You can do that by configuring two confirmation messages in your form. 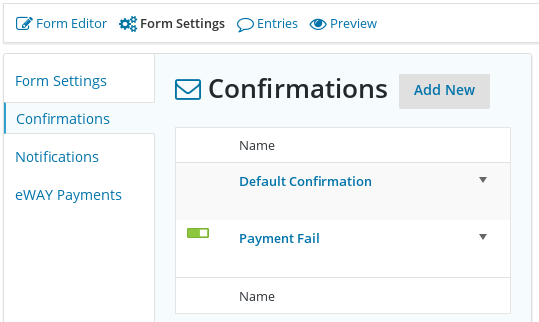 Set up the Default Confirmation as for a normal form, with a message for successful payments. It will be used by default, if another confirmation message doesn’t take over. Add a new confirmation for payment failures / cancellations, and configure Conditional Logic so that it gets used when the bank authorisation code (AuthCode) is empty. Successful transactions will have an authorisation code, but failed and cancelled transaction won’t have one. Successful transactions will now get the default confirmation message, and failed / cancelled transactions will get the conditional confirmation message instead.